HTC have today unveiled the HTC J Butterfly, a 5-inch flagship smartphone sporting the first 5-inch Super LCD 3 display giving us the first 1080p Full HD screen on a smartphone and. Running Android 4.1 Jelly Bean the smartohone was shown off by Japanese carrier KDDI and in addition to the 5-inch 1920-by-1080 pixel Full HD screen it also packs a 1.5Ghz Snapdragon S4 Pro quad-core processor and 2GB RAM. On the camera front there is an 8-Megapixel main camera, a 2.1-Megapixel front-facing camera and 16GB internal storage with microSDHC expansion as well as the expected WiFi, Bluetooth 4.0, NFC and LTE. If that wasn't enticing enough the J Butterfly is also a global phone meaning it will work on CDMA and GSM networks so you could pick one up in Japan and use it here in Europe as long as it is unlocked. The J Butterfly is also waterproof with an IPX5 rating so it seems perfectly suited to the wet English weather. Of course the main attraction is the 5-inch display, featuring a staggering 440-ppi the J Butterfly can claim to well and truly trump the new iPhone 5 which although features a Retina Display can only offer a ppi of 326. 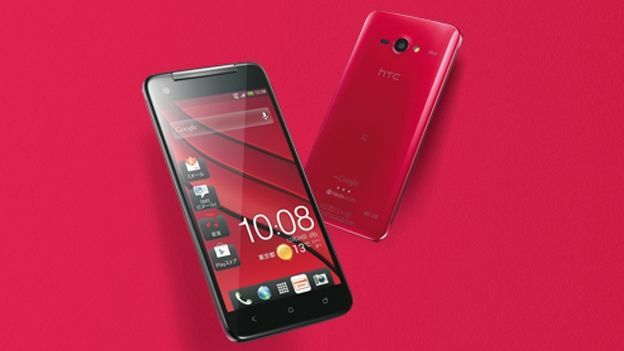 The HTC J Butterfly will be available from December in Japan in a choice of red, white or black.